The suspects were arrested by troops of the 159 Battalion, under Operation Lafiya Dole, after a tip-off, the Director of Army Public Relations, Brigadier General Texas Chukwu, said in a statement on Saturday. “The two suspected fuel suppliers were arrested by troops while filling jerry cans at a gas station owned by a member of Yobe State House of Assembly,” the statement read in part. The station manager and attendants were arrested and are being questioned but the truck driver is at large and efforts are being made to track him down. 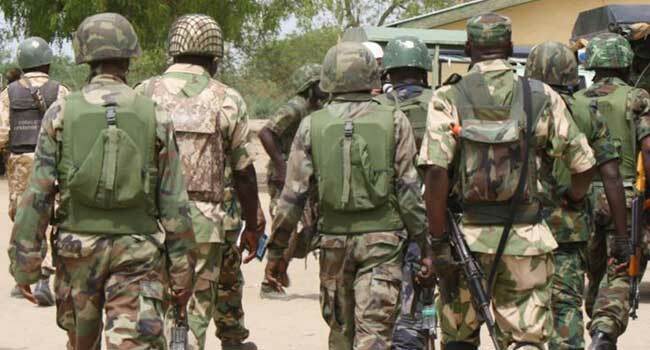 Meanwhile, in neighbouring Borno State, troops of Operation Lafiya Dole have neutralised some Boko Haram terrorists. The troops made neutralised the terrorists while carrying out a clearance operation at Kwari village in Monguno Local Government Area of the state following a tip-off. Items recovered include Two AK 47 rifles, Three FN rifles, Five Magazine, 24 rounds of 7.62mm special ammunition and 18 rounds of 7.62mm NATO ammunition. The army appealed to members of the public to report any suspicious movements or activities to the nearest security agency for prompt action.